If you’re considering buying an above ground swimming pool, then you probably already know that it’s a big deal. Buying the best above ground pool will give you and your family many summers of fun in the sun. However, if you buy an inferior model, one that’s not made well or doesn’t mean your needs, then you’ll just end up with a piece of equipment that’s destined to cause you a lot of headaches and trouble. One of the main things that need to be determined when shopping for a pool is what kind of above ground model you want. Do you want one that’s all metal, one that’s an inflatable swimming pool or one with plastic but durable PVC rails? Well, it all depends on how you intend to use it but it should be noted that what the pool is made of is not the only consideration that needs to be made. There are a whole range of other factors to consider including water purification system, whether it’s a freshwater or saltwater model and water capacity. In order to help you find a good quality model that fits your needs, we’ve decided to not only give you the top ten models available but to give you some hints and tips on maintaining your new toy when you finally buy it. So without further adieu, let’s check out some of the best models before we move onto those tips. When it comes to these types of pools, it seems like Intex models occupy several positions on my list, with a few exceptions for the spots occupied by competing brands. Of course, some of the models are better than others, so you should the following list into consideration because I’ve listed them starting with the best first and ending with the ones I liked the least. 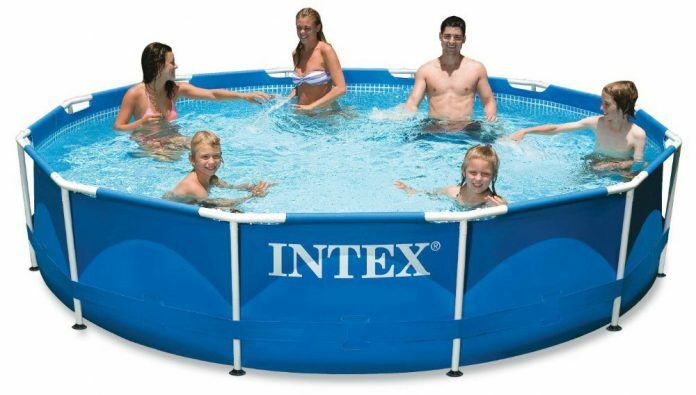 This Intex metal frame pool is a model that’s not only designed to be fun to use but also easy-to-setup. All that has to be done to get it up and running is to lay the liner out flat, assemble the frame, and fill the pool up with water. This pool is 12-feet by 30-inches and comes with a filter pump that cleans approximately 530 gallons per hour. And when you need to drain it, it has a convenient drain plug that easily connects to a garden hose so that the draining water can be drained away from the pool area. It’s a model that’s designed to bring many hours of summer enjoyment year after year. This H20Go! frame pool is a model that’s perfect for people with young children. With a 102″ x 67″ x 24″ frame size, this pool is large enough to give everyone room to move around but isn’t excessively deep. It has a 600+ gallon capacity and is made from a combination of heavy-duty PVC and polyester with 3-ply side walls. Another advantage of this frame pool is that it is quite easy to put up and take down as well. Just connect a garden hose to the spout and easily drain the water—safely away from your home or pool area. This model is destined to become an integral part of family reunions and special events. This Intex pool is designed to not only be durable but to have all of the features the average pool owner would need. It has laminated sidewalls that are made of three distinct layers that make this pool extra strong and extra durable. This model can hold up to eight people and has a sand pump filter that will keep the water crystal clear. Other features of this pool include an enclosed ground cloth, pool ladder, debris cover and a drain plug that connects to a garden hose so that the pool can be easily drained. This model puts many other oval above ground pools to shame with its tough construction and its assortment of useful features. This Intex rectangular pool is designed to be strong, useful and nice looking as well. It’s made with durable steel frames that have been powder coated for rust resistance and laminated PVC sidewalls that are tough and long-lasting. Other features of this model include Krystal Clear Sand Filter Pump that’s capable of moving 1,200 gallons of water per hour, a ladder, a ground cloth and a debris cover. And to ensure that it can be drained as easily as it can be filled, this unit also has a drain plug that can be connected to a hose to drain the 4, 500+ gallons of water away from the pool area or your home. This pool is perfect for someone who needs a decent-sized pool that will provide many summers of aquatic enjoyment. The Intex Easy-Set seems like a model that’s custom built for fans of oval above ground pools. 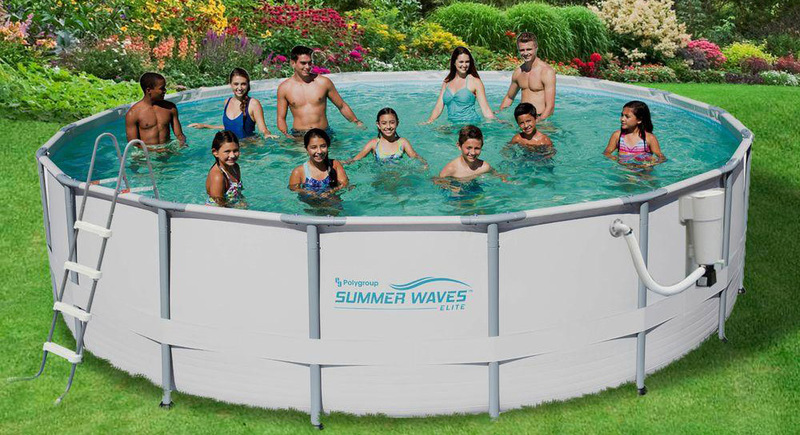 It has a decent 15-feet by 42-inch size and can be set up and ready to be filled with water in 20-minutes or less. It features a Krystal Clear Cartridge Filter pump that can move 1,000 gallons of this pools 3200+ gallons of water per hour. This model also has tough laminated PVC sidewalls and a drain plug that can be attached to a garden hose so the water can be drained quickly and efficiently. Other features of this model include a ladder, debris cover and a ground cloth. This oval above ground model should provide you and your family with many years of enjoyment. While not as quick and easy to set up as other models made by Intex, this unit still sets up and is ready for water in approximately 90-minutes. This 14,300+ gallon pool is designed to be extra strong with durable powder coated steel frames and laminated PVC sidewalls. It also features a Krystal Clear Filter Pump and saltwater system to keep the water ultra clean by converting the salt into chlorine–which also means that shock isn’t necessary to keep this pool clean. Another great feature of this model is its drain plug that can be hooked up to a garden hose. This unit also comes with a ladder, debris cover and a ground cloth. It’s a good set for pool enthusiasts who are looking for a heavy-duty model that can be left up all year long. This unit is designed for people who are looking for a pool that’s as easy to set up as an Easy-Set but wants the durability and increased strength of a metal frame pool. It’s an oval shaped model that can be set in approximately 30-minutes by following the instructional DVD and can be drained just as quickly thanks to its convenient drain plug that hooks right up to a garden hose. This unit also has a Krystal Clear Cartridge Filter Pump that can move 1,000 gallons per hour of this pool’s 2,800+ water capacity. And since his unit is made with a metal frame and laminated PVC sidewalls, users will love its durability. This is definitely a model that should provide many summers of aquatic enjoyment. Sometimes all a person needs to enjoy a wet and wild summer is a basic pool set and that’s exactly what this Steel Pro Frame Set offers. It’s an absolutely no-frills set that just delivers a great pool that you can play and swim in. This 15-foot by 48-inch pool holds 4200+ gallons of water, is very easy to set up and has a flow control drain valve that lets you drain the pool quickly and easily. It’s a pool set that doesn’t have a lot of extra features but really doesn’t need them anyway. After all, all you really need is a receptacle to hold water so you can enjoy all of your aquatic fun. This Heritage set is designed for people who don’t want to mess with an inflatable swimming pool but wants something that’s easy to set up. This model features a 7-inch galvanized and painted steel ledge, a heavy-duty resin ladder, and a 19-inch sand filter equipped with a 1-horsepower motor. All of which suggests that this is a durable model that should provide years of enjoyment. And if it doesn’t, the manufacturer offer a 25-year warranty and free lifetime customer support. Which is why some people have decided to invest in buying one of these pools for their backyard or play area. Tired of cheap blow up pool models that don’t last more than a swimming season or two but don’t want to spend a fortune on a metal pool? If so, then you’ll probably want to take a look at this model. 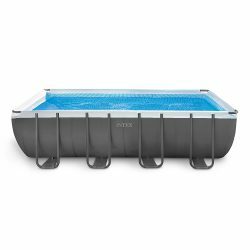 It’s a rugged steel pool with a one-inch top rail that’s durable and easy to not only set up but also to maintain. This pool measures 15-feet by 52-inches and comes with a 12-inch sand filter system with a half-horsepower water pump. It also comes with a skimmer and a return. This model is sure to provide many summers of swimming pleasure—all without breaking the proverbial bank. One thing that you must remember when buying a new above ground model is that this isn’t a blow up pool and what I mean by that is that it’s not as easy as just emptying out the pool and putting it away. There are day-to-day tasks, as well as week-to-week and month-to-month tasks, that must be handled to keep the pool in good working order. Here are some things you’ll need to do to your pool in good working conditioning and to ensure the water is clean and ready to be used. Keep the level of your water around mid-skimmer. Don’t make it too low or too high. Follow the above steps and you can rest assured that your pool will provide you with many, many years of use. These tips will also prevent your swimming pool from becoming a microbial cesspool that is a breeding ground for microorganisms. After all, it’s a pool and not a pond and shouldn’t pose a hazard to your health or the health of the neighborhood.